Despite urgency late in the third period, the Bruins fell to the Anaheim Ducks 3-2, in the first contest of their four-game West Coast trip. The Bruins were once again without center David Krejci, who has been battling an undisclosed injury that has forced him out of the lineup for 10 of the last 12 games, as well as for the next four games. Defenseman Zdeno Chara also stayed behind, but is hopefully expected to return to the lineup for the first time since October on December 11. The Ducks have found themselves hampered with injuries as well, with a decent amount of players out of the lineup with miscellaneous injuries. Recent call up Craig Cunningham, forward Seth Griffith, and defenseman Kevan Miller were scratched, while forward Matt Fraser and defenseman Zach Trotman slotted in for the B’s after being scratched last game. 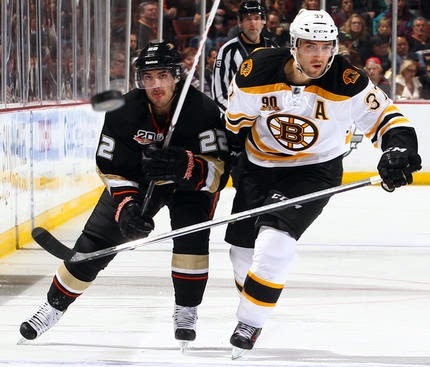 The Ducks were put on the power play 2:48 into the game, with Chris Kelly taking a seat in the box for tripping. The B’s were able to make the kill and had a few offensive chances of their own. A great chance for Matt Bartkowski came after a forecheck from Reilly Smith and Matt Fraser, but Frederik Andersen was able to read the backhand. The Bruins were put on their first power play of the night when Hampus Lindholm was sent to the box, but despite five shots on goal, the penalty was killed. Shortly after, the B’s were rewarded another penalty as Ryan Kesler was called for slashing, and the Ducks made the kill again. Both teams picked up the urgency in the final minute of the first, with desperate attempts to strike first coming on both ends, but the first period ended tied 0-0. A chance for the B’s came early in the first, with the Gagne-Campbell-Paille line creating a few chances. Paille’s shot was the greatest chance for the B’s to pull ahead, but the puck hit the post and stayed out. The Bruins were put on the penalty kill due to a penalty on Fraser, and the B’s created some shorthand chances early on Anaheim’s penalty whilst making the kill. Milan Lucic drew a tripping penalty, sending the Bruins to the power play. This time, the B’s were able to capitalize – a smooth pass from David Pastrnak to Milan Lucic led to a shot on net. A deflection off of Andersen’s stick found Brad Marchand, who put the Bruins up 1-0. Pastrnak’s assist is his first point as an NHL player. 57 seconds later, Sami Vatanen answered, tying the game for Anaheim. Joe Morrow got sent to the box for tripping with 6:23 left in the second, but the B’s made the kill. Joe Morrow took off on a breakaway after exiting the box, but was robbed by Andersen. Anaheim pulled ahead with 22 seconds left in the second, despite many chances for the B’s to clear the puck, and Devante Smith-Pelly blatantly holding Bartkowski’s stick. Smith-Pelly was credited with tipping the go-ahead goal. An insurance goal for the Ducks came just over five minutes into the third, with Matt Belesky beating Tuukka Rask right off the faceoff. With 9:40 left in the third, Simon Gagne put the Bruins within one with his second goal of the season. Despite a great effort late in the third, the Ducks skated way with the win.